Where do you come from today? "Business today cries out for more field marshals." The word "positioning" took on a new meaning for business in 1972. That was when Al Ries and Jack Trout ran a series of articles on "The Positioning Era" for Advertising Age. Countless copies of the series were distributed in pamphlets, and the book that followed, Positioning: The Battle for your Mind, became one of the top-selling business books of all time. The concept was simple: the best marketing strategy is to own a piece of the prospect's mind. "Like the memory bank of a computer, the mind has a slot or position for each bit of information it has chosen to retain," they wrote. Those slots are arranged like rungs on ladders. Established positions, especially leading ones, are ideal to own and hard to dislodge. Avis paid heed to this principle with its classic "We're Number Two, we try harder" campaign, which used its subordinate position to advantage. In another classic positioning story, 7-Up created a whole new ladder by calling itself "the UnCola," which also repositioned the whole cola ladder. Over the quarter century since Positioning came out, Ries & Trout have clarified the concept without enlarging it, which is a remarkable demonstration of their wisdom. Here's a catalog of their work. All the links lead to their entries in the Amazon.com book store (the local branch of which is now open here). Minds are limited. Even a little information is too much. Minds hate confusion. The only solution to over-communication is over-simplification. Minds are insecure. They're emotional, not rational. Minds don't change. A made-up mind is a closed mind. Minds lose focus. Don't expect one to understand why your department store also sells insurance. While Ries & Trout may co-own the top rung on the positioning ladder, they're not alone. One guru who has written extensively about the subject is Regis McKenna, the Silicon Valley legend who describes "dynamic positioning" at length in Relationship Marketing: Successful Strategies for the Age of the Customer (1993) and his new book, Real Time: Preparing for the Age of the Never Satisfied Customer. McKenna sees positioning entirely as a matter of relationships. Meanwhile, Ries & Trout see positioning mostly as a matter of advertising. The difference isn't just a matter of temperament, interest, focus or ladders in the brain. It's a matter of origin. Ries and Trout come from advertising. They wrote Positioning originally to promote their own ad agency. McKenna comes from public relations. Today all three are high-paid gurus on the lecture circuit who each try to underplay their humble origins; but in fact those origins have everything to do with their own positions, and with what they say about positioning. Where do you fit in the world? Of all those qualities, the only one you can't change is where you come from. A company can change its name, its business, its leadership, its mission statement, its products and everything else. But it can't change its origins. General Motors will always come from Alfred Sloan. Apple will always come from Steve Jobs and Steve Wosniac in their Sunnyvale garage. Hewlett-Packard will always come from Bill Hewlett, David Packard and their garage. Microsoft will always come from Bill Gates and the impulses that pushed him out of Harvard. A more subtle view is that GM will also always come from Alfred Sloan's preference for implementation over innovation, that Apple will always come from Steve Jobs' artistic temperament and that H-P will always come from their founders' obsessions with quality products for niche technical markets. Subtler qualities also persist from origins, such as H-P's elevated sense of community (which leads some to call the place "Bedford Falls"). Every company's life is a vector that makes the most sense when you know where it starts: literally, where it comes from. The same goes for every product and every person. The original personality embodied in an identity is like a fractal formula: a unique algorithm that produces the same kinds of shapes no matter where it goes or how big it gets. That formula is the company's DNA. It's the nature that persists no matter how the company is nurtured or damaged (or both) over time. When you know where Regis McKenna and Al Ries come from, you can understand why one guy cares about relationships and the other cares about advertising  even though both talk about positioning. Their origins show up in all their originalities. The answer isn't obvious (APL means American President Lines, which has nothing to do with presidents, so...). It doesn't seem to matter (wanna see the original Radio Shack?). But in fact we're always coming from somewhere. Just ask George Lakoff. George is a professor of linguistics and cognitive science at UC Berkeley, and the leading linguist of our time. He is the author of Metaphors We Live By, Moral Politics: What Conservatives Know that Liberals Don't and other books. In short, George is the leading expert at telling us where we're coming from, even if we don't know it. And we usually don't. Take a subject such as ARGUMENT. When speak of "defending" a point, "defeating" an opponent, "attacking" a weak point or "winning" a debate, our language comes from a conceptual metaphor. That metaphor is ARGUMENT IS WAR. Conceptual metaphors are embodied in nearly everything we talk about. When we speak about "wasting," "saving" and "budgeting" time, we are also saying TIME IS MONEY. When we speak of youth as "morning" and old age as "sunset," we are also saying LIFE IS A DAY. When my son Jeffrey "arrived" a year ago, I discovered that the conceptual metaphor for BIRTH is FREIGHT FORWARDING. We say a baby is a "little bundle" or a "package" that is "delivered" by "labor" through a "birth canal." (I also gathered that this is one reason why two or three generations of babies were treated like packages and mothers like trucks.) In More than Cool Reason: A Field Guide to Poetic Metaphor (1989), George Lakoff and Mark turner show how ARRIVAL has been a long-standing conceptual metaphor for birth and DEPARTURE for death. An expected baby is "on the way," while a dying person is at "death's door" and "passing away." Arrival and departure are both part of the conceptual metaphor LIFE IS A JOURNEY. "In the middle of my life's road, I found myself in a dark wood" are the opening words of Dante's Divine Comedy. Metaphors carry meanings that dictionary definitions barely infer. The dictionary may define death as the end of life; but since LIFE IS A JOURNEY, we see death as "the end of the road" or a "St. Peter's gates." In fact, a matter so important as death can employ many different metaphors. This is why we also see death as winter (Shakespeare), sleep (Aristophanes) and a coachman (Dickenson). Metaphor is not a simple matter. By personification we call death "the grim reaper." By metonymy we use Bill Gates to mean all of Microsoft. We don't need to go any deeper into cognitive science, however, to see that when we talk about markets we ofthen employ the conceptual metaphor MARKETS ARE BATTLEFIELDS. By the same conceptual system we understand that BUSINESS IS WAR. This is apparent when we see how much we speak of both in military terms. It is important to note that these systems derive from and are sensed as experience. Right now the "browser war" between Netscape and Microsoft is very real. To the combatants, to reporters covering every battle, and to the rest of us who follow the story, there really is a war going on. Yet we might also observe that nobody is being killed. In fact, both companies are growing, and doing so with a high degree of cooperation. Most Microsoft and Netscape products get along well on desktops and servers. Some of the biggest customer's of Netscape's Suite Spot server products are also the biggest customers of Microsoft's Windows NT operating system. Some mighty big customers have deep and abiding relationships with both companies. For example, News Internet Services has vast server farms that host Fox News, TV Guide and ZD/Net and other large corporate sites that together serve up zillions of Web pages every minute. On that farm, Suite Spot and Windows NT need to function flawlessly together, and they do exactly that. There's a war going on here? Of course there is. And yet there isn't. The fact that everybody thinks there's a war going testifies to the veracity of the metaphor. But clearly there's something else going on as well. Countless new markets are being created constantly, all populated by companies that grow rapidly, often (if not mostly) at nobody's expense. A whole new world of enterprise is exploding "on" the Internet, a place that has no surface other than millions of computer screens. The threshold of enterprise for business on the Internet is almost absurdly low. Lacking the physical properties of real estate, no one vendor can corner a market or a product category there. Absent the gravitational pull of physical mass, all kinds of "virtual" properties are exploding. Wealth is being created at an unprecedented pace, as if out of nothing. The stock market has transformed from a bull to a genie on speed, granting wishes seemingly without limit. Yet to read the press and watch the tube, you'd think even this wacky new world is nothing more than a fresh new spread of Gettysburgs, Waterloos and Boradinos. Why? Because we think metaphorically, and we talk about new developments using old metaphors. And it's easy to do. We've been talking about markets as battlefields ever since merchants sold trinkets on the streets of Ur. MARKETS ARE BATTLEFIELDS has always been common sense. Yet, George Lakoff says, "Nothing is 'just' common sense. Common sense has a conceptual structure that is usually unconscious. That's what makes it 'common sense.'... One of the most fundamental results in cognitive science, one that comes from the study of commonsense reasoning, is that most of our thought is unconscious -- not unconscious in the Freudian sense of being repressed, but unconscious simply in that we are not aware of it. We think and talk at too fast a rate and at too deep a level to have conscious awareness and control over everything we think and say. We are even less conscious of the components of thoughts  concepts. When we think, we use an elaborate system of concepts, but we are not usually aware of just what those concepts are like and how they fit together into a system." Think of how we turn what we mean into what we say. It's something we do all the time, but the process almost defies examination. We rarely know how we will end the sentences we begin, or how we began the sentences we just ended. The same thing happens when we listen. Even if we understand the other person perfectly, it's hard for us repeat everything back verbatim. Yet we know what we're talking about, and we know what we're listening to. One reason is that we communicate concepts, those concepts are metaphorical, and every metaphorical concept comes with a box of words that makes it easy to talk "in terms of" those concepts. 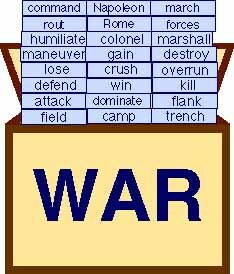 And no box of words has been a more useful metaphorical source, or served for a longer time, than the one called WAR. "Compared to war, all other forms of human endeavor shrink to insignificance," George Patton famously said. Hence the metaphorical imperative to elevate a subject's significance by speaking of it in terms of war. "Bill Gates has already won everything," says the cover story by Mike Malone in the current Upside. In the same issue, David Kline writes about the "time bomb" of a coming "labor war" in Silicon Valley. Brock Meeks talks about how the pro-encryption bill in congress was "torpedoed," while Newt Gingrich went "AWOL." This kind of talk isn't just abundant; it's standard. Clearly we need some new metaphorical concepts here. In The Death of Competition: Leadership and Strategy in the Age of Business Ecosystems, James F. Moore uses nature  ecology  as a metaphor. But, as one reviewer put it, "The book is chock full of fancy buzz words that probably won't take hold in the real world any time soon." Like Paul Hawken and Margaret Wheatly, who write about business in terms of fields, gardens, growing, tilling and nurturing, Moore (on his GeoPartners site) writes about mapping, landscapes, life and heart. In "Make Money, Not War," I suggested that the metaphor MARKETS ARE CONVERSATIONS gives us the most accurate cognitive structure for a virtual world where space is abundant and markets are subjects we talk about, rather than places where we pound each other to pieces. The main problem is that the conversation box doesn't have enough words in it yet. That's largely because our experience of explosive yet noncombative markets is relatively new, and their operations are not well understood  or at least not understood outside the economics circles travelled by Brian Arthur and Paul Romer, who share a box of words that includes such EcoLatin terms as "increasing returns," "endogenous technological change" and "nonconvexities." Also, war is not an obsolete concept in today's business world. It's as valid as ever for many market conditions. We just have new conditions that cry out for a better metaphor, plus a need to hear the cries of old conditions that were never given full justice by military descriptions. After all, what companies and products do for customers has always mattered more than what they do against competitors. In other words, our conceptual systems are simply incomplete, much as physics was incomplete when it understood mechanics largely in Newtonian terms. Like the war metaphor in marketing, the domain of relevance for Newtonian mechanics is enormous, but incomplete. 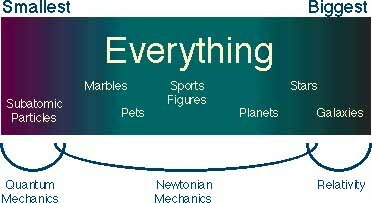 We still use Newtonian terms to describe most of the mechanical events we experience, from the behavior of pool balls to the orbits of planets. But there are forms of mechanics that are outside the Newtonian scope. In those domains we now rely on other laws. At the microscopic end, quantum mechanics explains the operations of subatomic particles. At the macroscopic end relativity explains the relationship between time, space, gravity and matters at the extremes of energy and mass. None of these laws invalidate each other; and to some extent they overlap. Their domains of relevance simply cover different regions of the scale between the smallest and the largest things. Like every specialty, they have their own vocabularies. Again, some words are shared with other specialized vocabularies; and many scientists are multi-lingual in overlapping specialties. But essentially there are different boxes of words for quantum mechanics, Newtonian mechanics and relativity theory. And when scientists talk about those subjects, they understand which box of words is in use. What does this have to do with positioning? Everything. But when they wrote that, "today" was 1972. And remember where they came from. They wrote, "Most of (our) examples come from the most difficult of all forms of communication  advertising. A form of communication that, from the point of view of the recipient, is held in low esteem. Advertising is, for the most part, unwanted and unliked. In some cases, advertising is thoroughly detested." Like war, advertising was hell in 1972. A detestable business, as our field marshalls say. Frankly, it still is. "Advertising is what you do when you can't go see somebody. In his essay "Death from Above," John Perry Barlow observes that, "Over the last 30 years, the American CEO Corps has included an astonishingly large percentage of men who piloted bombers during World War II. For some reason not so difficult to guess, dropping explosives on people from commanding heights served as a great place to develop a world view compatible with the management of a large post-war corporation." Also of advertising campaigns. Advertising has many conceptual metaphors, but the most fundamental are those of the bombardier. The recipients of advertising are "consumers" that are "targets" for "explosive" messages "aimed" through "flights" to make "impressions" and "deliver maximum impact." Clearly this is not something the recipients of this ordnance demand. 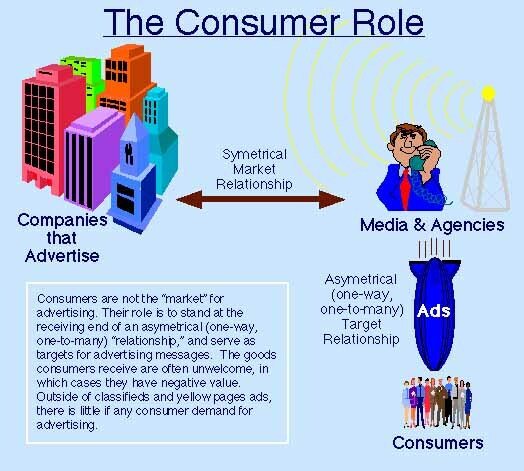 Advertisers, media and agencies often speak of consumer populations as "markets," which suggests some quality of demand and involvement. But there are neither. The market for advertising is one that exists entirely between companies that advertise and the media they advertise in. The goods sold are time slots in broadcasts and spaces in print media. 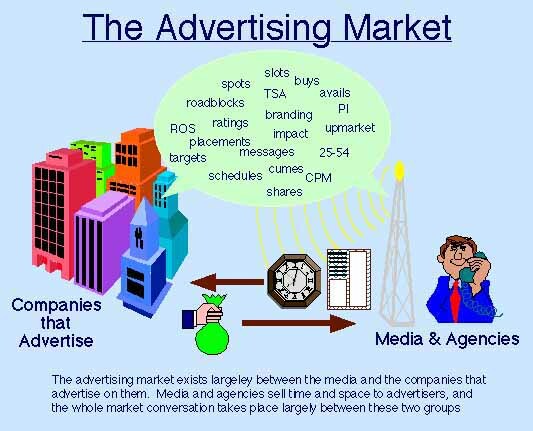 The market conversation is all about the advertising business. Consumers contribute almost nothing to it. In fact, consumers are expected to be so passive and bovine that they'll hold still not only for constant bombings through broadcast and print, but for a process called "branding," which burns company images and slogans onto their mental hide. Needless to say, there is little demand for most mass-market advertising. Most ads are so unwelcome that consumers mute them with buttons on their remote controls, punch up other stations, or turn pages looking for more interesting "content." In effect this means ads are less than free: they have negative value. The only forms of advertising for which there is real and constant demand are classifieds and yellow pages. These, of course, are far outside the main currents of the advertising conversation. But there is something new with which they do have a kindred spirit: Web pages. The Internet changes everything. 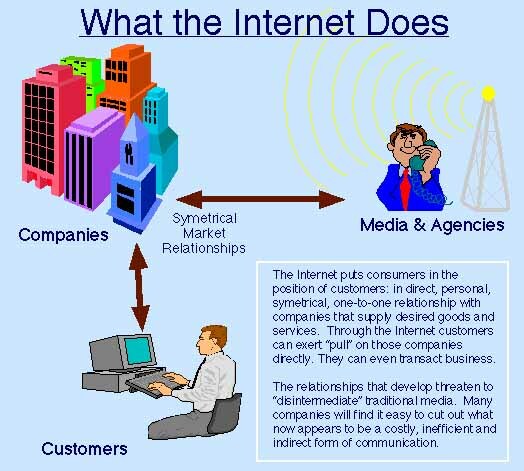 Even though media and agencies have tried to treat the Internet as yet another asymmetrical medium, the direct, personal, abundant and symmetrical qualities of the Internet threaten to undermine and disintermediate traditional media, most of which are indirect, impersonal, scarce and asymmetrical. Here are some of the things Regis McKenna is saying about this new situation in Real Time: Preparing for the Age of the Never Satisfied Customer. "Technology. . .has made it possible for companies to be in touch with their customers individually and in real time. . . . The most dramatic implication of this shift to Real Time marketing is the complete transformation of the concept of brand. Branding of a new and entirely different kind is being born-brand as an encapsulation of actual, experienced value. . . . The nature of that experience is increasingly determined through customer preferences expressed in dialogue with producers or service-providers-an exchange made possible by technology, and one in which the consumer now has the upper hand." David Hodskins has two definitions for "brand." The short one is "a measure of trust." The long one is "the capitalized value of the trust between a company and its customers." Either way, trust is the issue. Trust has value. You can charge more for it. In Ries & Trout's parlance, it occupies a unique position in the customer's mind. There are a lot of new ways to create that trust  ways that are more direct, personal and inexpensive than a mass-media ad campaign that might take years and also might not work. You won't discover them by continuing to treat customers as bombing targets. Not the least important reason is: they can bomb you even more easily. And they have the money. "This above all: to thine own self be true. Positioning at its most fundamental is an inside job. It's a matter of finding where you come from and expressing that essence, that character in everything you do. It's about the spine in your identity: the original stuff you can't change, not matter what you do or where you go. We're talking here about the deepest and most honest part of your company: the place where your integrity lives, the essence that gives strength to your character. This is the stuff that can't help positioning itself because it's totally original: it can only come from you, and it always comes from you. You'd think this stuff is obvious, but usually it isn't. Here are a few cases in point (from the How We Think page on The Searls Group site). Today Nordstrom is easily the most successful large clothing store in the country, if not the world. Why have they grown and thrived through a period when Broadway, Emporium, Gimbel, Macy's Weinstock's, Ivy's, B. Altman, Sachs, Sears, Pennys, Belk, Alexander's and all its other competitors have failed, disappeared or struggled? Is it their customer service? Their products? Their selection? Their operations? Their management? Those are effects, not causes. What makes Nordstrom a hit is where those things all come from, which is the original Nordstrom family shoe store in Seattle. The shoe business is hands-on and personal; but more importantly, it relies on a big selection, backed by big inventory. Sure enough, what really sets Nordstrom apart from its competitors is its gigantic inventory. They buy and stock goods in quantities that other stores would consider ridiculous -- in spite of its success for Nordstrom. So even today, Nordstrom continues to come from the shoe business. That big inventory make it easy for them to give good personal service. Their sales people say "no" a lot less. And so do their customers. Indeed, Nordstrom's corporate act is all about customer service. On the market's stage, that's the role they play. But they wouldn't be able to play that role -- or occupy that "position," in marketing parlance -- if it wasn't in character. And that character comes from the family shoe business. We all know that Apple came from two guys in a garage. But is that what made Apple a $10 billion company that acquired and held enormous customer loyalty through ten years of revolving-door management and an endless series of market disasters? No. Where Apple came from was -- and still is -- Steve Jobs' Art. Xerox may have invented the graphical user interface, but Steve Jobs was the guy who obsessed about putting it in a computer "for the rest of us." Here's a guy who cared so much about the look of a printed word (right down to the curve of each serif) that he personally pushed laser printing into the world. The legacy of that obsession continued to define Apple's character, long after Steve was gone. To show just how much Art matters to Steve Jobs, consider how, in an interview on Public TV, he positioned Microsoft with just four words: "They have no taste." Would a statement that wicked and succinct even occur to anybody else? When you consider that Apple comes from Steve Jobs, and Steve Jobs comes from Art, lots of other things make sense, from his rejection of cloners (what artist wants to be cloned?) to his disinterest in the opinions of developers and customers (whose job it is to admire and buy his art, not to originate it). Everybody who follows Novell assumes it came from Ray Noorda and some cronies in Salt Lake City. But Novell was like one of those multiple stars that only appears singular at a distance. A close look at Novell's success in the Eighties shows the influence primarily of four people: Ray Noorda, who ran the company; Drew Major, who wrote NetWare (the company's key software product), and two others whose original thinking changed the whole network conversation -- Craig Burton and Judith Clarke (now Judith Clarke Burton). In the early eighties, networking was mostly a conversation about "pipes & protocols." Customers bought whole networks from the wires on up, including everything that ran on those wires, from file servers to the network interface in the backs of PCs. If you bought a Sytek or a Corvus network, you couldn't use anybody else's hardware or software. That's just the way it was. It was Craig Burton's idea to make NetWare into a Network Operating System (a NOS) that runs on everybody's wires works with everybody's hardware -- including the network cards in the back of every PC. NetWare thus became a new platform for network services that could run everywhere. But nobody talked about networking on Novell's terms until Judith Clarke literally invented whole new venues for network conversations. These included a magazine (LAN Times), a trade show (NetWorld), a reseller channel and a class of networking professionals (Certified Netware Engineers, or CNEs). By the end of the Eighties the world talked about networking largely on Novell's terms. So Novell came from an "embrace & extend" position long before Microsoft adopted the phrase. And it began to slide after Craig and Judith left the company, in 1989. That was when Novell adopted an oppose & deny attitude toward Microsoft. With the Burtons gone, Novell completely forgot where it came from. Worse, it rewrote history, denying the importance of the open and embracing qualities that led to NetWare's success. Now the company has embraced Netscape and other parties in the Java conversation, but its voice in that conversation is quiet, in spite of hiring Eric Schmidt, who is one of the chattiest CEOs on earth, and was perhaps the best Java advocate when he worked at Sun. Java clearly comes from Sun, or a skunkworks inside of Sun. But Sun has never clearly said what Java is, even on the "What is Java" page at the JavaSoft Web site. Take a look. The closest thing to a definition you'll find is, "It is becoming known as a computing platform." Prior to this development, Java has mostly been described as roster of virtues, chief among which was "write once and run everywhere." Those virtues were delivered by a combination of ingredients: the Java language, Java Beans class libraries, and the Java Virtual Machine, among other things. Meanwhile the biggest platform vendor in the world calls Java the single thing it undeniably is: a language. Smart move. Great positioning, too. Why? Because it's true. Whatever else Java may also be, two facts are clear: 1) It's is a language; and 2) it's a weapon against Microsoft. That's why it's "becoming known as a computing platform." In metaphorical terms, it's a Trojan horse, and there was no way Microsoft would ever buy it, even if the everybody else did, including most of the venture capital community and thousands of developers. On October 8, 1997, Sun sued Microsoft for violating its agreement to license the entire horse. So now the market conversation is almost entirely about the fight between Sun and Microsoft. Java's virtues are a secondary matter. Why hasn't Sun been clear about Java? Partly there's the Trojan horse issue. It wouldn't have paid Sun to announce the contents of the horse. Because Java came from too many places and changed its identity too many times, even before it was born. Today there are camps that dispute whether its creator was Patrick Naughton or James Gosling, or some other combination of people. It surely suffered some momentum loss internally as well, when the name was changed to Java from what its many parents had been calling it for years, which was "Oak." In 1995, when I asked Bill Joy what Java was, he said "it's an argument," because nobody at Sun could agree on a clear answer to the question. Or just about anything else. "That's what Java is to me," he said. "Something I argue about all day." George Gilder, Brent Schendler and many other good thinkers expect Java to torpedo Microsoft. I don't agree. Which means, finally, we need to look at Microsoft. The cover story in the latest Upside is "What, Me Worry? Bill Gates Has Already Won Everything," by Mike Malone. It's brilliant. Malone is Silicon Valley's Jimmy Breslin. A fighting Irish guy whose most out-there piece was "The pussification of Silicon Valley." He's funnier than Breslin, too. And a better writer. If you want the final case against Microsoft and Bill Gates, this is certainly the most enjoyable. He calls Bill "the Louis XIV of tech, our Rain King," who demands that "his vassals, the CEOs of all the corporations that depend on his largesse, to pay fealty at his new Versailles--a gigantic, mutant suburban ranch house." While the story of Bill Gates is so unusual it verges on the bizarre, and in a few ways (such as the big house) he looks to be playing the classic tycoon, it's easy to overlook the subtle virtues that put him in that position. To recap the obvious stuff: they only hire smart young people, who they pay more in stock than salary; they have this amazing ability, no matter how big they get, to turn on a dime; they have no more sympathy for their own failing products than they do for their competitors; they're run by the richest guy in the world, who lives in a big mutant suburban house. And so on. Now: where does Microsoft come really come from? The desktop. More importantly, the person using the desktop. Microsoft loves users. Can't get enough of them. While lots of companies care about customer service, but Microsoft wallows in it, thrives on it. It's almost a sexual obsession: they crave the contact. And they give as well as they get. "There isn't one feature in Word that some user didn't ask for," one Microsoft executive once told me. When you look at a Microsoft product, what you see is Microsoft's side of a conversation with its users. That conversation isn't one between Bill Gates and the 200 million people who use his company's products (although he certainly does his share). It's between Microsoft employees and those users. And between those employees and other participants in various market conversations. This includes thousands of developers, customers, resellers and everybody else who writes and talks about interests they all share. This is why the company moves like a school of fish. Everybody not only knows where the company comes from, but where it's going to, all the time. Where they're going is toward customers: all those people the company talks to every day. And all the new ones they want to meet tomorrow. If the Internet conversation turns into a Windows conversation, we can't just blame Microsoft. We also have to blame the millions of other people in the same conversation. And its competitors' ignorance of their involvement. Marketing gurus have been chanting about customer orientation ever since Theodore Levitt turned us on to that virtue over forty years ago. Lots of companies talk about it, but Microsoft lives it. You can measure the difference in Microsoft's market value. And by the size of Bill Gates' house. Where does your company come from? Where do you come from? Are you living and working in affirmation or denial of what makes you most original? Those are the real questions your positioning campaign should start by answering. Those are the questions you should start answering. If you aren't answering them already. Positioning is a matter of getting honest and real with your selves and your customers. You can't job it out. the late Jim Valvano  for my money the most impassioned, inspired, inspiring and funny basketball coach of all time  once spurred his team to victory by throwing down his clipboard, pounding his chest with his fist, and screaming at his players, "IT COMES FROM HERE! IT COMES FROM HERE!" You know where your heart is. If you pay attention, you know where your company's heart is too. Come from there and you can't lose. Talk to the same thing in your customers and everybody will win.